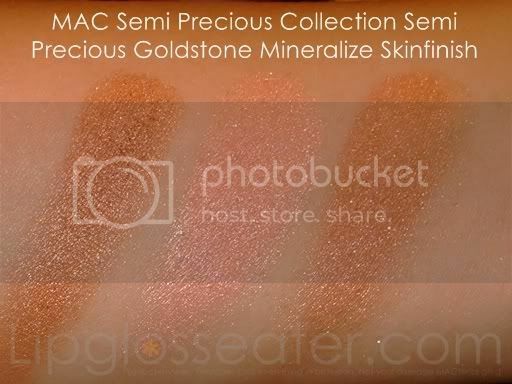 This is the annual Mineralize collection MAC puts out once a year which usually comprise of baked mineral eyeshadows, blushes and the multipurpose Mineralize Skinfinishes (see previous collections here and here). 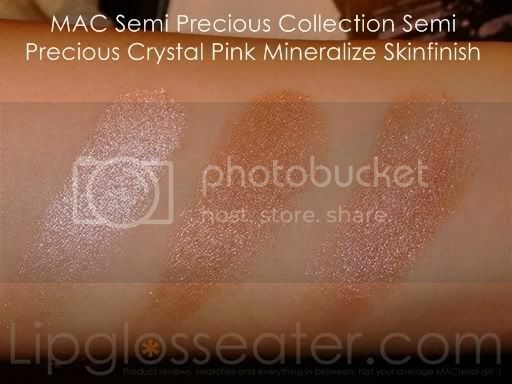 I'm not really a fan of their mineralize range but I'll have to say that I'm beginning to be a convert! Their eyeshadows and skinfinishes have definitely came a looooong way from their early gritty, glitterbomb ancestors. 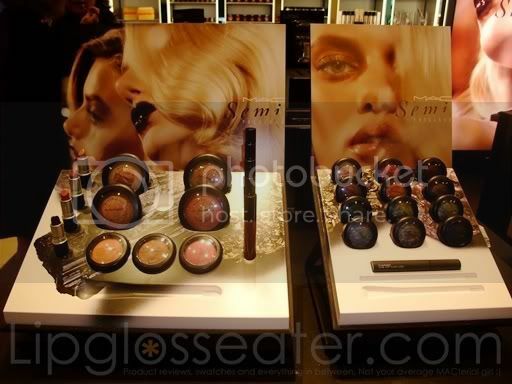 The eyeshadows, especially, in this collection - although there were several shades that contain large glitter particles, all shades have a beautiful smooth texture and are oh so pigmented. The MSFs, on the other hand, were just ok for me. Don't get me wrong - they are gorgeous colors and buttery smooth, but they are abit too shimmery for my liking. 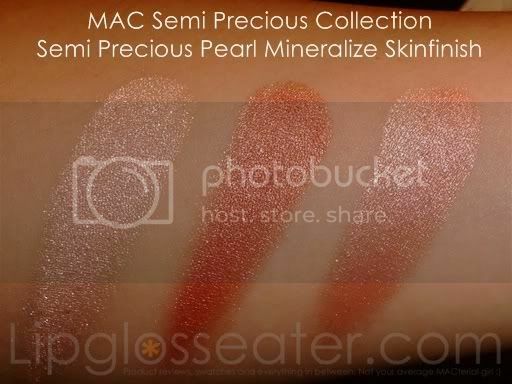 The Mineralize blushes are lovely though (as always! :D)! 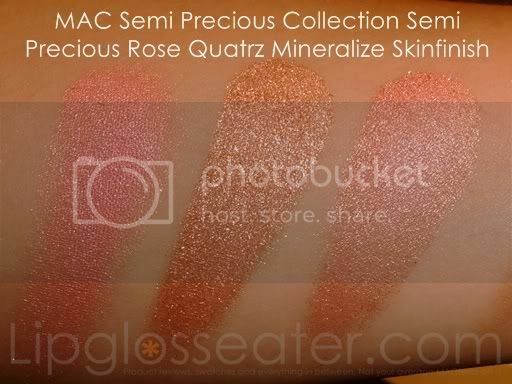 The mineralize blushes are quite lovely! 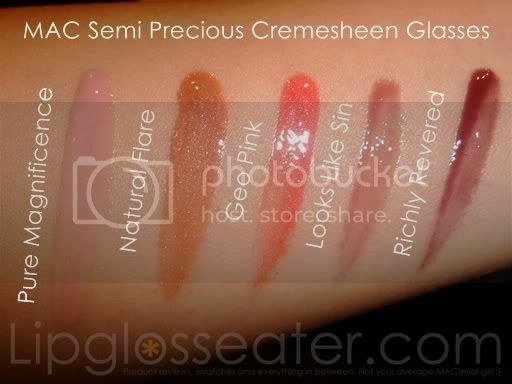 They're pigmented, smooth yet not over-the-top shimmery! Thats all for the color story! :D I don't usually review brushes in my swatch posts, but i'll make an exception for the ones in this collection. 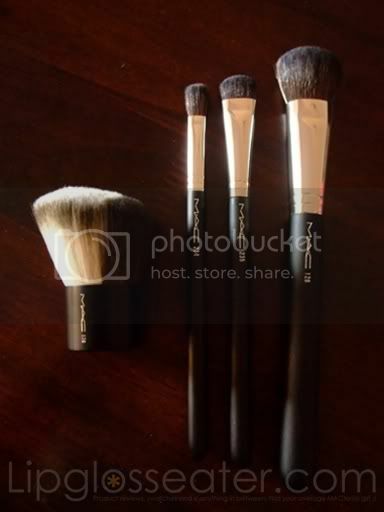 There are 4 brushes - two face brushes and two eye brushes. These have two sides to them - one side is made of synthetic fibres (for cream products) and the other side, natural hair for powder. I didn't buy anything of this collection. 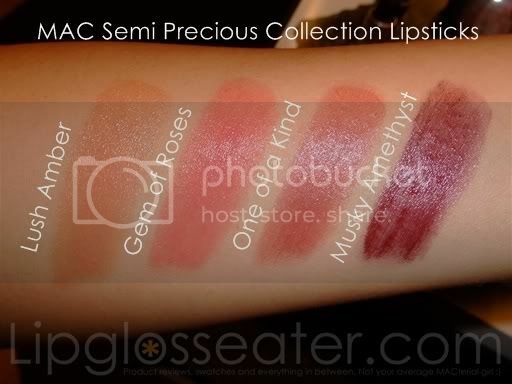 Saving my money for the upcoming "MAC me over" collection .. can't wait for it. All the blues and greys in your last swatch are gorgeous! i just bought golden gaze.LOVE IT! lol. the msf were so smooth and tempting! but still look too glitter for my liking.. by the time i reached there, they only left 179.. wish it were long handle i'll buy it.. Thanks for the swatches. The Semi Precious Rose Quartz looks beautiful. Yeah i knowww!! I had to literally peel myself away from the counter before i do some serious damage to my wallet - knowing my OCD self i would probably want to buy back everything from the displays! lol! Hmmm you're the 2nd person who said that! I guess thats the thing with Mineralize shadows, each pot is different!